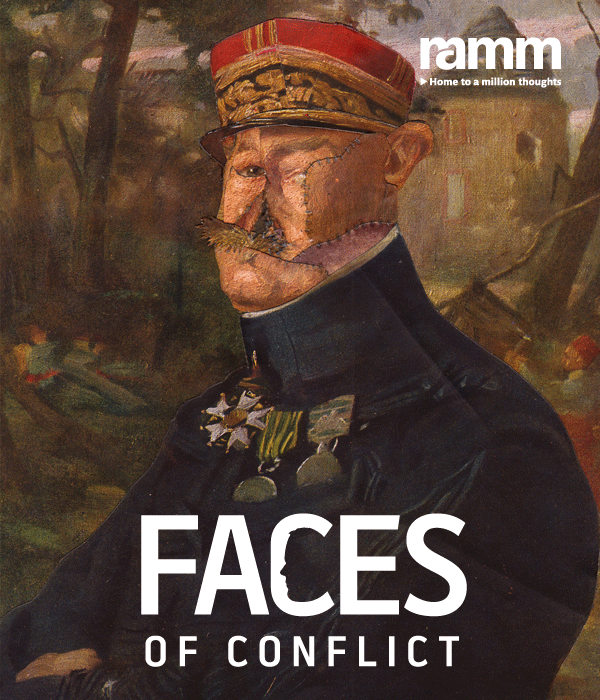 Faces of Conflict, the major UK exhibition arising from 1914FACES2014, opened at the RAMM on 17th January 2015. 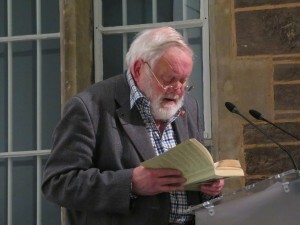 The private view was accompanied by a uniquely moving and powerful reading by Michael Longley, CBE. Michael read from his recent collection The Stairwell (2014) and spoke about the key role played by the First World War in his poetic creation. Michael’s father served as the teenage commander of ‘Longley’s Babies’, one of the London-Scottish regiment’s infantry companies. Michael’s father’s experience marks Michael’s own reflections on a variety of conflicts from different historical periods, and The Stairwell sees remarkable juxtapositions of scenes from the Trojan wars and the First World War. In particular, Michael’s poem ‘The Tin Noses Shop’ offers a glimpse of the gueules cassées and of Anna Coleman Ladd’s work to create portrait masks in the war years. We were honoured to be able to include this work and Michael’s equally striking work ‘Face’ in the exhibition. Faces of Conflict explores the long-lasting influence upon artists and surgeons of the facial injuries suffered during the First World War, and includes contemporary work by Paddy Hartley, Eleanor Crook, Rene Apallec in dialogue with a range of historical artefacts. The exhibition is at the RAMM until 5th April 2015. As part of Paddy’s work on 1914FACES2014 he has recently been in action in Queen’s (College of Humanities) making fabric-based pieces which will form part of the exhibition Faces of Conflict at the RAMM in 2015. 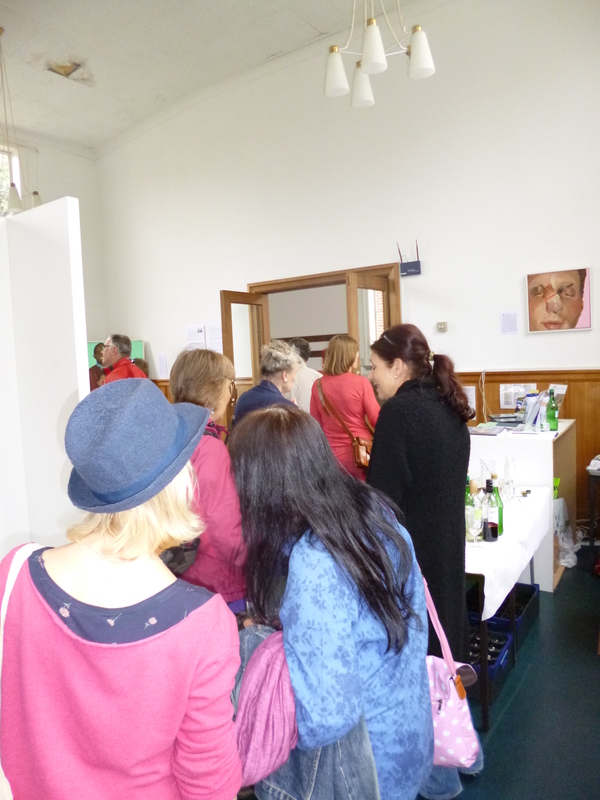 The 1914FACES2014 / Saving Faces exhibition, curated by Cristina Burke-Trees, opened on 5th June 2014 in the Chapel Gallery, Hannah’s at Seale Hayne. 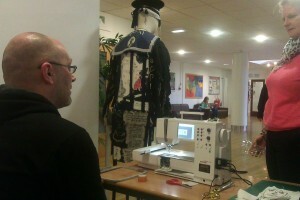 The exhibition features work by Paddy Hartley, artist in residence, including a uniform sculpture based on the life story of Walter Yeo. Yeo was badly burned at the battle of Jutland in WWI and Paddy’s sculpture refers both to Yeo’s wartime experiences and the pioneering facial surgery he underwent after returning home. 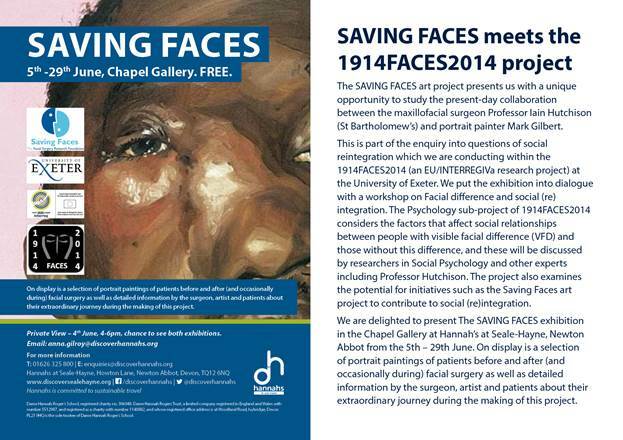 The SAVING FACES art project, meanwhile, presents us with a unique opportunity to study the present-day collaboration between the maxillofacial surgeon Professor Iain Hutchison (St Bartholomew’s) and the acclaimed Glaswegian portrait painter Mark Gilbert. Iain Hutchison established the Saving Faces project in 1999, funded by a small legacy following the death of his mother, Dr. Martha Redlich. Painter Mark Gilbert took up the offer to work within the surgical department of St Bartholomew’s and soon started painting the portraits of patients before and after (and occasionally during) facial surgery. At the outset it was hoped that the project would illustrate, in a form that was accessible to the general public, what is possible with modern facial surgery, and show that people with facial disability are able to enjoy happy, successful and fulfilled lives. Iain also wanted to give an artist the opportunity to paint these unique faces as they progressed through their surgical and emotional journey. Finally he felt that sitting for and seeing their portraits might have a cathartic effect, allowing the patients to come to terms more rapidly with their altered appearance. Our presentation of the Saving Faces exhibition is part of the enquiry into questions of social reintegration which we are conducting within 1914FACES2014. On 16th June, we put the exhibition into dialogue with a workshop on Facial difference and social (re)integration. The Psychology sub-project of 1914FACES2014 considers the factors that affect social relationships between people with visible facial difference (VFD) and those without this difference, and these will be discussed by researchers in Social Psychology and other experts including Professor Hutchison. In its concern with social reintegration and rehabilitation, this event draws upon the rich history of Hannah’s at Seale Hayne, including its brief spell as a military hospital for soldiers returning from the trenches with shell-shock. Acknowledgements: our thanks to Clemency Horsell, Suzanne Steele and, above all, Cristina Burke-Trees. Grateful thanks to Paddy Hartley, Iain Hutchinson and Saving Faces. This workshop considers issues of social (re)integration arising from facial difference. 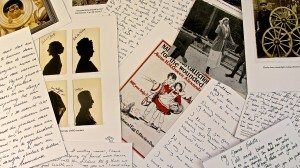 It takes place in the unique surroundings of Hannah’s at Seale Hayne and will include a visit to the 1914FACES2014 / SAVING FACES exhibition at the Chapel Gallery, Seale Hayne. 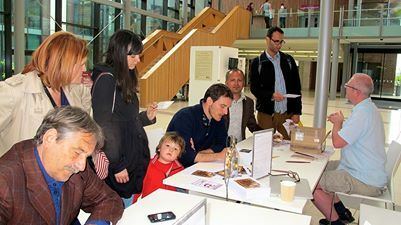 This workshop, held on 31st March 2014 at the Innovation Centre, University of Exeter, made a fruitful contribution to our exploration of the long-term cultural legacy of facial disfigurement. 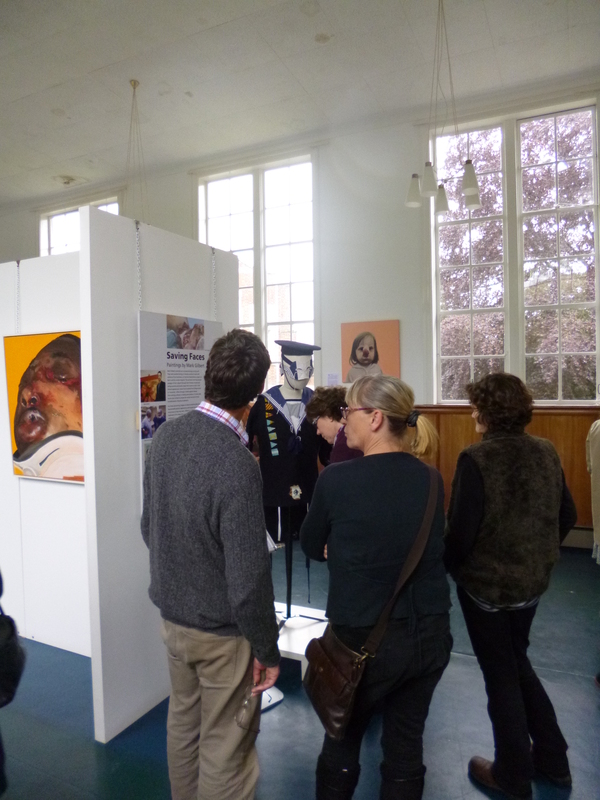 In underlining the close links between the face and the passions and studying their representations in past and contemporary works, participants tackled questions that lie at the heart of the 1914 FACES 2014 project, such as the expressivity of the faces of First World War disfigured combatants and the perceptions and artistic depictions of disfigurement since the medieval period. A key concern throughout the day was the legacy of Duchenne de Boulogne and the enduring influence of the idea of the passions in contemporary representations of the face. 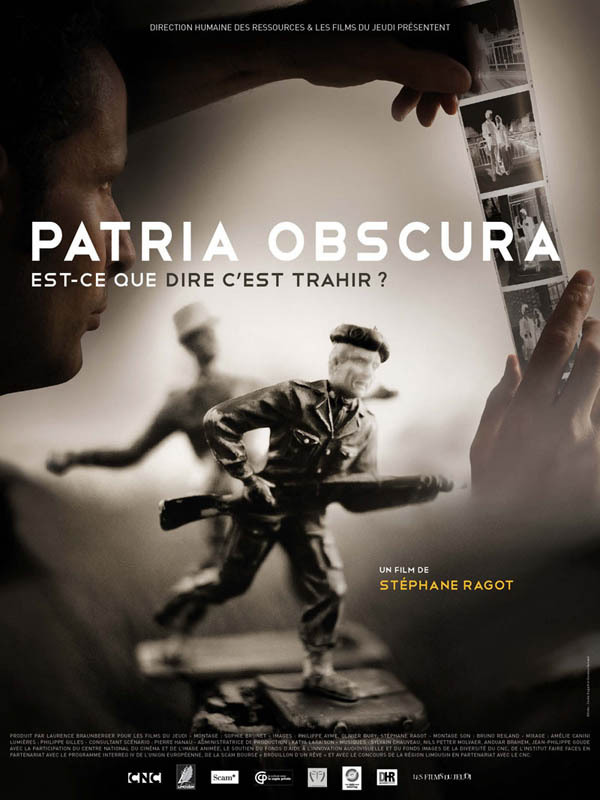 The starting-point for this dialogue was François Delaporte’s paper, ‘La Fabrique du visage et des passions’. 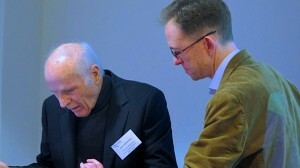 Drawing upon Professor Delaporte’s landmark publications in the field, including L’Anatomie des passions (2003), the paper addressed the revolutionary influence of Duchenne, not only transforming understandings of the muscle physiology of the face, but also leading to repercussions in numerous other fields including medicine, art, literature, cinema and philosophy. The session was chaired by Professor Bernard Devauchelle, and led into a round table featuring François Delaporte, Bernard Devauchelle and the maxillo-facial surgeon Professor Iain Hutchison (St Bartholomew’s). The session identified numerous avenues for further discussion, and informed the consideration of modern and contemporary treatments of the face in philosophy and the arts later in the day. The second paper, by Julie Mazaleigue, discussed the representation of sexual desire, including representations of bodily dysmorphia, with special reference to the face and the gaze. The enquiry stretched from Franz von Bayros’ controversial illustrations of the nineteenth century all the way through to twenty-first century cinema. Alex Murray’s paper then questioned whether the face can be considered as biopolitical, assessing the brief analysis of the face in Agamben’s work and considering its articulation in technologies of security and surveillance. Joe Kember focussed on Harry Langdon’s facial performances in silent cinema of the early twentieth century. An exploration of facial grotesquery, the non-expressive face and the allegorical meaning of the face in silent cinema culminated in an analysis of the face in short silent film clips. 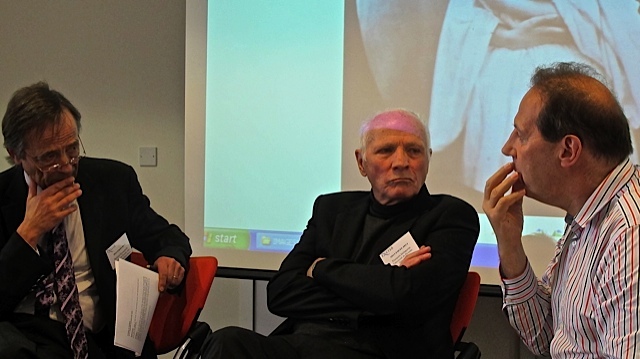 David Houston Jones, meanwhile, discussed the enigma of the expressive and inexpressive face in the work of Samuel Beckett and the French photographer Luc Delahaye, considering Delahaye’s debt to Walker Evans and documentary traditions while also subverting contemporary and historical norms concerning the visual representation of the face. The final paper of the day came from Professor Patricia Skinner, who gave a cutting-edge account of the medieval face and the iconographical traditions which underlie it. In particular, Skinner’s paper considered the relationship of the passions to the deadly sins: love, pain, fear and anger and the pathological understanding of those states. Skinner assessed the diagnostic value of physiognomy texts – associating facial features with character traits and behavioural tendencies – frequently bound together with collections of medical texts after the 13th century. 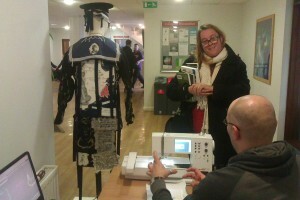 Accompanying the workshop was a selection of artworks by Justin Jones, curated by Cristina Burke-Trees, ahead of the upcoming Faces of Conflict exhibition beginning in January 2015 at RAMM. Jones’s work draws upon two key strands of 1914FACES2014: the facially injured soldiers of the first world war, and the Passions, the theme of today’s workshop.